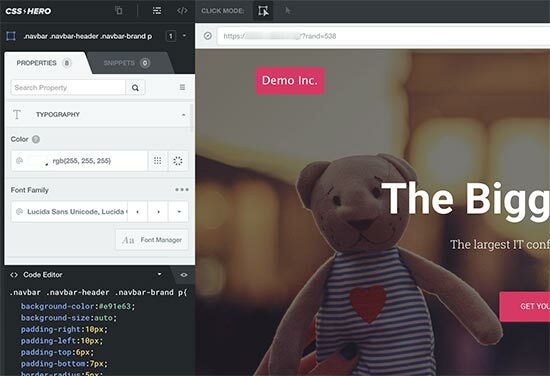 If you’re one of the many beginners who want to customize your WordPress site design without touching CSS, then you’re in luck. CSS Hero plugin for WordPress allows you to make design customization without touching a single line of code. In this updated CSS Hero review, we will show you how to use CSS Hero to customize your website, and why we believe it’s one of the plugins every WordPress beginner should try. 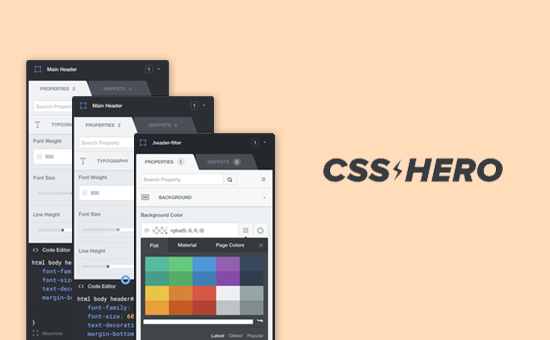 CSS Hero is a premium WordPress plugin that allows you to design your own WordPress theme without writing a single line of code (No HTML or CSS required). You have the ability to undo changes which is extremely helpful for beginners. All changes are saved as an additional stylesheet, which means you can upgrade your WordPress theme without worrying about losing the changes. 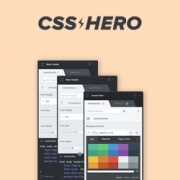 If you’re a designer or developer, then you will find CSS Hero equally as good. It works well with all popular WordPress themes and frameworks. You can quickly make changes to a child theme, and then export it to be used on a client’s website. Usually, we’re very skeptical about point-and-click design customization plugins due to their bloated size. However, CSS Hero truly impressed us from the start. If you were to ask us for an honest CSS Hero review, then we will give it a 5 out of 5 star. First you need to install and activate the CSS Hero plugin. 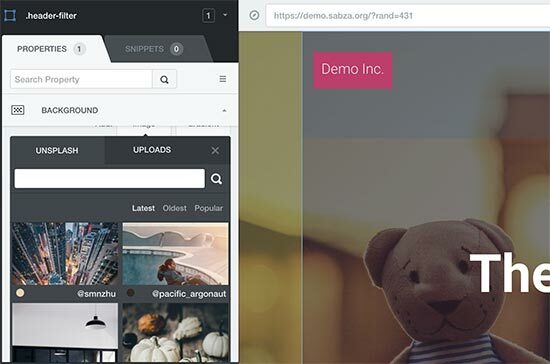 For more details, see our step by step guide on how to install a WordPress plugin. It is a premium WordPress plugin with pricing starting from $29 for a single site (totally worth the investment considering the time and hassle it will save you). Use the CSS Hero coupon code: WPBeginner to get a special discount of 34% Off. If you are buying the PRO plan, then the same code will get you a whopping 40% discount. Upon activation, you will be redirected to obtain your CSS Hero License key. Simply follow the on-screen instructions, and you will be redirected back to your site in a few clicks. 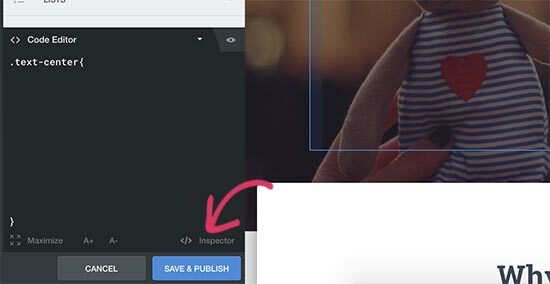 The goal of CSS Hero is to provide you a WYSIWG (what you see is what you get) interface for editing your theme. Simply visit your website while logged in, and you will notice the CSS Hero button in the WordPress admin bar. Next, simply click on any element on your website, and CSS Hero will show you the CSS properties used by your theme for that particular element. These will include common CSS properties for the selected element like the background, typography, borders, spacing, and more. You can click on any item to expand it and then edit the CSS properties using a simple user interface. As you make changes, you will notice the custom CSS magically appear below. If you are learning CSS, then you will find it useful to see how different CSS changes are applied with the result in live preview. Having trouble finding royalty free images for your website? CSS Hero comes with built-in Unsplash integration which allows you to browse, search, and use beautiful photographs in your website’s design. 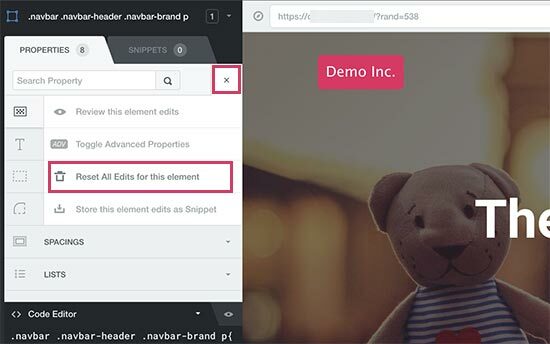 CSS Hero also comes with some ready-made snippets that you can apply to different elements on your website. Simply switch to the Snippets tab in the left column. As you make changes to your website, CSS Hero will autosave those changes but not publish them. To apply these changes to your live website, you need to click on the Save and Publish button. One of the best features of CSS Hero is the ability to undo any changes you make at any time. CSS Hero keeps a history of all the changes you make to your theme. Simply click on the history button in the CSS Hero toolbar to see the list of changes. You can click on a date and time to see what your site looked at that point. If you want to revert back to that state, then simply save or resume editing from that point. This doesn’t mean that changes you made after that point would disappear. They would still be stored, and you can revert back to that time as well. It does not get any simpler than that. But what if you only wanted to revert changes you made to a particular item? In that case, you don’t need to use the history tool. Simply click on the element that you want to revert and then click on the reset button. The most challenging aspect of web design is device compatibility. You need to make sure that your site looks equally dazzling on all devices and screen sizes. 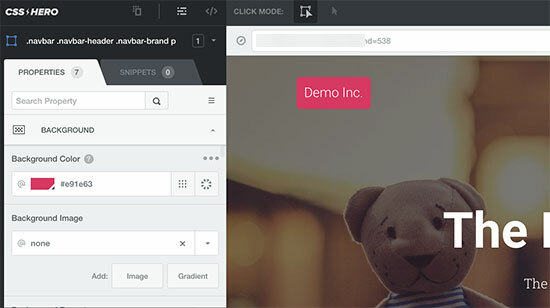 Web designers use a variety of tools to test for browser and device compatibility. Lucky for you, CSS Hero comes with a built-in preview tool. Simply click on the desktop icon in the CSS Hero toolbar and then click on a device type. You can choose from mobile, tablet, and desktop devices. The Preview area will change into your selected device. 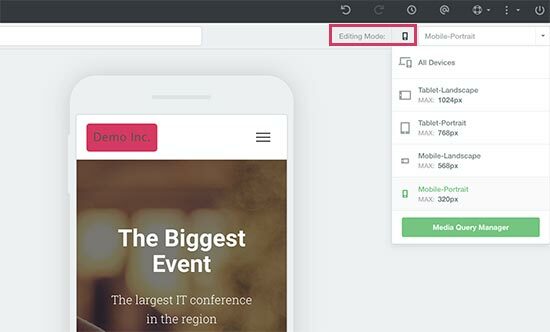 You can now edit your site while previewing it for mobile devices. 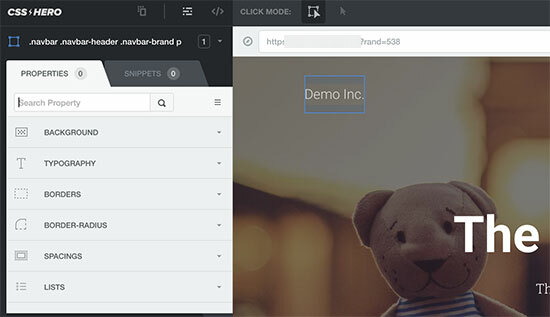 This tool is particularly useful to tweak your theme’s design for mobile and tablets. The official CSS Hero website has an ever growing list of compatible themes. 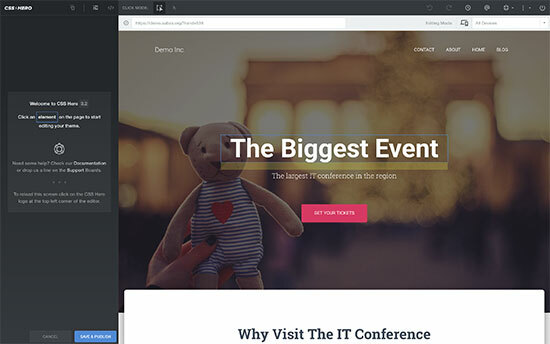 This list includes many of the best free WordPress themes. It also has the most popular premium themes from shops like CSSIgniter, Themify, StudioPress, and more. CSS Hero comes with a feature called Rocket Mode Auto-detection. If you are using a theme not included in theme compatibility list, then CSS Hero will automatically start using rocket mode. Rocket Mode tries to guess the CSS selectors from your theme on its own. This works out perfectly most of the time. If your theme follows WordPress coding standards, then you would be able to edit almost everything. CSS Hero is regularly tested with top WordPress plugins for compatibility. This includes contact form plugins, popular page builders, WooCommerce, and others. If you are using a WordPress plugin which generates an output not editable by CSS Hero, then you can request the plugin author to fix that. They really don’t need to do much to provide compatibility with CSS Hero. We hope that you found our CSS Hero review useful. You may also want to see our ultimate guide on improving WordPress speed and performance for beginners. I just started up a new website and have been crazy frustrated with the inability to customize themes very much. A lot of the controls are locked behind paying for a theme, but I’m not even sure if I like the theme enough to risk paying for it because I can’t edit everything enough. Will CSS Hero let me sidestep buying themes and edit the free versions? It would depend on the customizations you are looking for, CSS hero will certainly help you customize your site without the need for a paid theme. You may want to take a look at their demo page on their site to see what the plugin is able to do. Amazing how good this is in the review. Maybe it’s got something to do with all of the affiliate links that you’ve got peppered throughout it to make referral money from it? I’m not saying that the plugin isn’t good, but these sort of reviews are hard to take seriously. If it was really good you could say so, but saying that it’s good on the same page as trying to make money from selling it makes it seem like a very big paid editorial advertisement for this plugin. At WPBeginner, we only recommend products that we have used and tested. Please see our disclaimer page to learn more about how we make money on this website. I’m a little confused as to why you would use CSS Hero with a theme builder like Elementor or Divi other than seeing the code that is use for a certain element. Am I missing something? Hi thanks for letting me be the first questiner. Still have broblems showing them w/o the image box on the main page but on the single product page I was able to ditch the image then sqoosh the placehold off the screen to the left. It didn’t really squoosh but it did allow the text to start at a more respectable starting point. I would still love to speak to someone that has enough free time to allow me to hire on a task based relationship. I could use some help making a better searchbar with to and from date and then some plus much more work to do and could use a partner to divie up the tasks and work together. Hi, found wpbeginner is really helpful for beginner as I am. One of the subsite under my multisite had installed with Affinity theme which we love very much. Can we modify the layout of BP under Affinity using CSS Hero? We are not sure, please contact the plugin author to learn if someone has tried it with BuddyPress and Affinity. 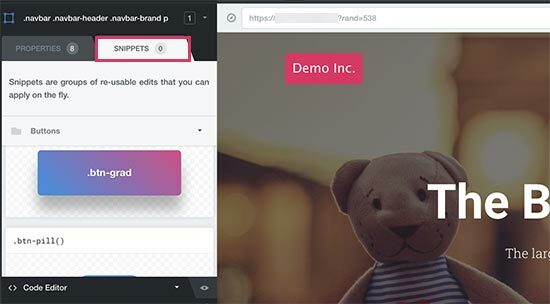 is this plugin compatible with Slider revolution (5.4) and Visual Composer? It could be a faster way in working with this – than with the others… in some cases. CSS Hero is a paid plugin available from its own website. Very nice overview and the plugin itself looks really useful. I have downloaded the CSS Hero, but not able to start it up on my computer. Is this plugin meant for Mack only? No, it is a WordPress plugin and would work on any WordPress installation. I just recently discovered WPB. Though I have been a WP site maintainer for several years i find that I am learning something new every time i view one of your tutorials. Thanks. I appreciate your efforts. Thank you for kind words. Don’t forget to join us on Twitter for more WordPress tips and tutorials. Will this plug in remove the menus on a Pavillioin theme, one of the standard WordPress themes? I see how it is kind of like firebug in that you can identify the part of the code you want to change but this plug in will actually allow you to change it without knowing code, right? But will it remove the menu instead of changing color or location or whatever. If your theme follows the standard WordPress coding best practices then you will be able to use it with CSS Hero without any problems. If you cannot, then please contact your theme’s support. I have have just returned to a wordpress site to update but the CSSHERO plugin does not work even though it is visible on the page. Nothing happens when I hover over content even though CSSHero seems to be active. The plug in active (V 2.1) but I noticed that the current version is 2.3 but no notice to update? Please contact the plugin’s support team. For a quick work around, you can manually upload the plugin’s zip file. Isn’t it is same as Chrome Dev Tools….I didn’t found any considerable differences b/w CDT n CSS hero…. BTW coupon code is not working for me too ??? I have Yuuta free theme. atm, I need this to be able to modify size, of my logo on the website ( using jetpack is terrible, it inserts the logo but it is a small and I can modify size or anything) is it going to work for me? How to make my blog become friendly with mobiles? sir how we can compress the theme coding manually ? i am using newspaper 7. Wow! It’s a real hero. Can CSS Hero be used with premium themes purchased on WordPress.com? No it cannot be used on WordPress.com. Please see our guide on the difference between self hosted WordPress.org vs free WordPress.com blog. I followed the link and came to page with “Pricing Plans”… A big no-no for me! I understand that this is the most efficient way for any business to make money, but I have no plans to subscribe to any “plan” – other than my website hosting (where I stopped to be a “loyal customer” when the service and load times aren’t right). There is no automatic subscription – you can renew every year if you want plugin updates – but the product WILL continue to work where it was installed – without paying each year. Purchased your plugin, the first site i tried it on WordPress Stella Magazine Theme……didn’t fly. Please contact CSS Hero support. If you’re changing the properties of, say, h2, can you change it for just one instance or one page, or can it only change all the h2’s throughout the site? It can do both. For example you can create a custom class for h2 tags on a particular page. Amazing! It’s really what I need. Working like a charm with DIVI and GENESIS! Yes. I have been looking for something like this for a while. Is it free ? if not, is there is any other visual css editor like this , which is free of cost ? This is not free as stated in the article. No you will not find any free visual editor like this one.